Paramacharya asks us to adopt Nani Ninda NyayaThe purpose of exalting a particular deity over the another is not to depreciate the latter. The underlying idea is that a person who worships his chosen god has unflinching faith in him and becomes totally devoted to him. Such exclusive devotion is called "ananyabhakti". The idea here, however, is not to regard other devatas as inferior to one's own chosen deity- an example of "nahi ninda nyaya". Some quotes from Ramanujas, though the person representing may not be authentic, it reflects the peace loving nature adn wish to neutralize contradictions and doubts. bhuvanArya guruvara - O Lokacharya who is best amongst acharyas. tvayi vilasati - When you are shining ra~Nge - in Srirangam, shrIdR^iShTipUra abhiShikte - washed by the merciful flood from the eyes sheShatalpena pumsA - of the Lord who rests on the bed of Adisesha, tvAm vinA - leaving you kathamiva (janA:) bhajante - how will (people) seek anyam - another? dinakarabimbe sati - When Sunlight is there ke pradIpam vahanti - will anyone carry a lamp? In this shloka, Desikan states that Pillai Lokacharyar is like a Sun compared to others. Again, this is not to put down other acharyas, but to praise Lokacharyar ("nahi nindA nyAya"). In our sampradhayam, our Azhvars and Acharyas have been called the Sun, because, just as the Sun removes the external darkness, they were born and removed the internal darkness. Azhvar is called "vakuLa bhUShaNa bhAskara"; Thirumangai Azhvar is called "loka divAkara"; Ramanuja is called "rAmAnuja divAkara:". Desikan says that with this Sun present, why seek anyone else? Sri Parasara Bhatta used to say that if one must seek refuge of our Lord, among the dasavathara,Varaha is the most perfect choice. Based on the "nahi ninda nyaya" (not denigrating others) he is reported to have said: Matsya avathara is sea bound so it cant extricate us from the sea of samsara. Koorma is itself pushed down into the sea by a mountain. Nrisimha is different above and below the neck so not to be resorted to. Vamana took over the three worlds by stratagem of showing tiny feet and then growing to gigantic proportions. Parasurama was rage personified. Rama(Bhattar's favourite in fact!) lost His wife for ten months. Balarama was too fond of drinking. Krishna, His wife Andal says, was always lying. We haven't seen Kalki yet. So Varaha, who without any shame(manam illa panri) took on the form of a boar and jumped into the dirty sludge and brought out Bhuma devi, is the one to be resorted to. Similarly He will extricate us from the "bheemabhavaarnavodare" the belly of the deep and dangerous ocean of existence. "Ye men if you realise and remember with all your humors in harmony, that I am the Cosmos and Unborn when you are "mens sana in corpore sana", then when death is iminent and you are like wood and stone, I will remember my bhakta, devotee, and take him to the highest abode, paramapada." It was this very Varaha who taught the easiest way to attain Him to Bhudevi. She repeated it to us when She took birth as Periazhwar's daughter, "Thoozhomai vandhu toomalar thoovi thozhudu, vayinaal padi manthinaal chinthithu pozha piyaiyum pukuthurvan ninavaiyum thiyinil thoosaakum ". If we come sanctfied, offering pure flowers, pay obeisance, sing with our mouths and think in our minds, the past transgressions and those that still stand will disappear like cotton in a fire. Sri Ambujavalli sametha Sri Bhoovarahaswamy Parabrahmane namo namah. I like this way of using nahi ninda nyaya to foster harmony among different sects and philosophies. It often troubles me to hear people denigrating other systems of philosophy (e.g. advaita versus dvaita) or ways of worship (e.g. guru worship). 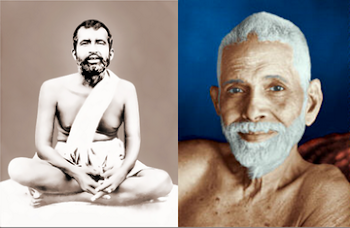 Sri Ramakrishna Paramahamsa was a great exemplar of harmony and acceptance in modern times.